Info "I need coffee! Coffee coffee coffee COFFEEEEEEE!!!" Coffee Jitters is one of Mona's microgames in WarioWare: Twisted! 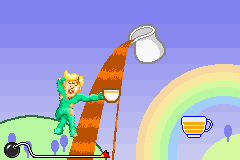 The player controls a man holding a cup. The purpose of the game is to fill the man's coffee cup by moving it under the stream of coffee. However, if the cup goes unfilled, the game is lost. 1st level difficulty: The stream of coffee is fairly large. 2nd level difficulty: The stream of coffee is slightly small. 3rd level difficulty: The stream of coffee is very small. This page was last edited on October 22, 2018, at 22:52.